The application, which was submitted on May 14, 2015 and posted this morning, details two different types of holders that are “configured to receive a smartphone or smart device.” The patent appears to describe two different form factors, one is goggle-like and seems similar to a Gear VR while the other more closely resembles a pair of glasses. There are multiple mentions of a cloud based system in the patent. Similar to the Gear VR, the “holders” could also house internal electronics including inertial sensors, an on-board processor, on-board memory, “shutter control logic,” and “optics controller logic.” Interestingly, the goggles version appears to have an on-board battery as well. On the Gear VR the internal hardware helps to create a more comfortable experience and is one of the platform’s major advantages over other mobile VR headsets like Google Cardboard. The outline of the internal electronics. While Sony’s potential mobile HMD also has internal hardware, it’s execution appears to be different from the Gear VR in many key ways, including potentially integrating with external hardware for positional tracking (more on that in a moment). One of the major differences that Sony describes in the patent is the headset’s approach to 3D images. The patent describes an onboard processor “configured to set the shutter control logic to successively switch between rendering image data obtained from the screen of the smartphone to only a lefteye-side of the optics and then only to a righteye-side of the optics.” What this is describing is essentially active shutter 3D, a technique that has been used for 3D TV displays for a number of years now. Basically, active 3D glasses close off (or shutter) the view to one eye and then rapidly switches to the other eye. When this happens quickly, at a minimum of 120Hz, each eye sees the picture half the time and you perceive a 3D image. The previously announced PlayStation VR HMD has a display with a 120Hz refresh rate, meaning Sony already has access to smartphone-sized screens that could be used in this way. Additionally, the active shutter approach could potentially be used to create a low-persistence effect on the Xperia Z5’s 4K LCD screen, which could be incredibly interesting as it help reduce motion blur. It is worth noting that in a recent post on Sony’s official blog the company said “We also believe Xperia Z5 Premium is capable of offering the clearest, sharpest Virtual Reality platform – we’re working on a few things here internally, so stay tuned for more news soon.” This patent may detail what the company was hinting at there. 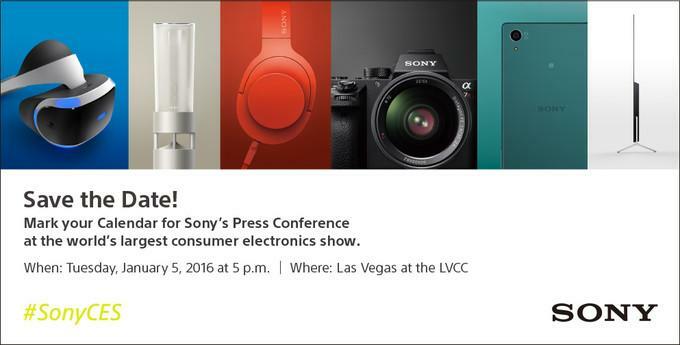 Sony also just sent out invites to a press event on January 5th, the day before CES begins in earnest. The invite appears to feature a brand new phone that that company may unveil at the show. In addition to describing a different methodology for rendering 3D in VR, the patent also outlines various methods to add positional tracking to the mobile headset. Including integration with Playstation VR’s tracking system using a series of LED lights on the front of the mobile headset, as well as another version which seemed to describe a lighthouse like integration. This system seems somewhat similar to Valve’s Chaperone system which helps set boundaries for a user, along with the forward-facing cameras which can detect things like small pets. It is an important addition that will help prevent VR related injuries. Sony also describes a variety of possible ways to provide input to a VR experience delivered by the headset, including with a system on the headset itself, voice control, a controller or a hand gesture. For example, “the user in the real world space can place his hand into a view space of the front facing camera, and this is detected by software operating on the smartphone to allow blending of the user’s hand 14 into the VR space. The user’s hand can be rendered into the VR space as the users actual hand or as augmented reality, or as a blend of augmented and real world.” This very well may be related to Sony’s recent acquisition of SoftKinetic, a company who specializes in computer vision problems like tracking hands in space. The patent outlines a number of other things related to the system, including what appears to be a method for streaming virtual reality through the cloud, a task that seems a bit heavy for today’s current wi-fi standards. Despite the number of signs that seem to be pointing to this being legitimate, it is important to note that the breadth of the patent appears to purposefully cover a lot of bases around the headset, offering multiple configurations. The patent also has only been filed and has not been approved. Sony has a major event this weekend in San Francisco, perhaps the company will begin to open up a bit more about its plans going forward then.